The continuing adventures of Shop Teacher's home for abused and abandoned tiny motors. The snowblowers that never failed to fail me this year, have been put in storage. They will be sold off in the fall and replaced by an Ego electric snow blower. I’ve been really happy with the Ego mower and leaf blower. I ordered the weed wacker, should be here tomorrow. I’m going all-in on the cordless electric yard tools. The kids toys keep multiplying. Bikes, scooters, balance bikes, cozy coupes, etc. We’ve had the black Power wheels Sierra for a year and a half now. I talked my dad into buying that new for the girls two Christmases ago. It’s finally getting some use. My oldest was afraid of it until her little sister showed her how it’s done a month or two ago. Yesterday, a stroke of unbelievable luck befell us. The exact model C5R popped up on Facebook Marketplace for $50. I called my dad, he told me to pick it up, he was good for it. A buddy of mine and I took a ride deep into the city and picked it up from a ridiculously big house a few blocks from Lake Michigan (cha-ching!). The body is beat, but the gearboxes are good. That’s the one leaning up against the wall. It is going to be the parts donor, and will then be used for the downhill power wheels races at the Gambler 500-Illinois in September. I think that’s called up-cycling! Onto the two-wheels-good department. Well, first two-wheels-bad, my expensive “reliable” scooter hasn’t been reliable lately. After stranding me (fortunately close to home), it appears the ignition switch has gone bad. That’ll be a $60 plus tax and shipping bite out of my wallet. I think I’m going to sell that one, and replace it with a Yamaha Zuma 125. The $100 Elite 80 in the back has been running better and better thanks to some Italian tune-up action. It still requires a shot of carb cleaner to start when cold, and won’t idle until it’s warmed up, but it really is running nicely once warm. Definitely $100 well spent. 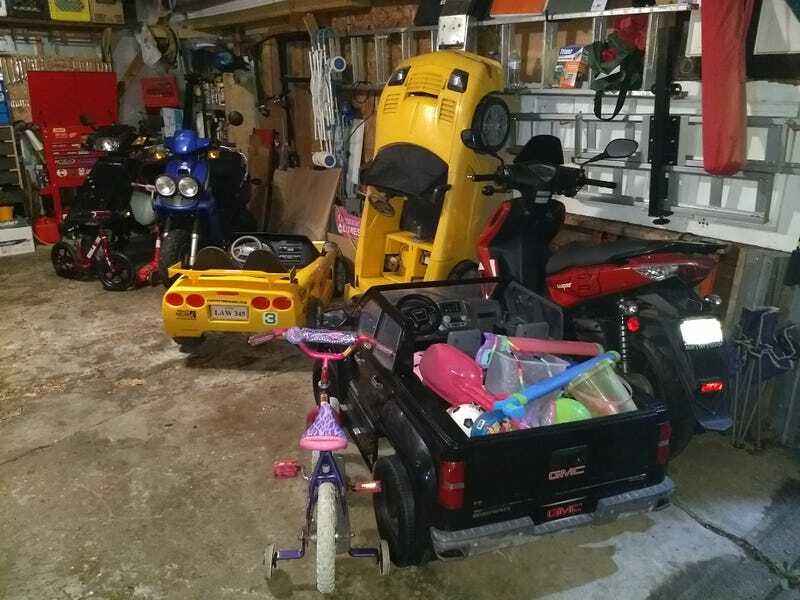 The blue 50cc Zuma in the middle is currently in the bed of my truck, and will be going to my buddy’s new house now that he had room to store it. I’m going to miss that plucky little guy!